I think you are super! You are my favorite basketball superstar. I've got posters of you all over my room (My mom even got mad because I was putting too many holes in the wall). Around here most people like Moses Malone, not me though. I've always liked you the best. Between you and me I don't think Moses Malone is smart. I'd like to ask you for your picture and an autograph, and also for a little word of advice for a young basketball player. (If that's asking too much I'll gladly take an autograph. Dr. J, I think you are the best player ever. Someday I hope I'll be as good as you are (someday is a along time). ps. I can't wait to see you next season. I hope you come in first place. Yes, but, did you get an autograph? I did actually along with a note... if I dig it up, I'll add it to the post. i only pull out the word cute on special occasions. with that said, that is one cute little note. As one of the kids in your school who thought Moses Malone was so great, I have to concede that Dr. J was superior, and Moses was not so bright. Great blog and photos. Oh my. SO FUNNY. Did you write anyone else or was it just Dr. J. Do you still idolize him or was it a passing phase? Maybe the best letter I've ever read! 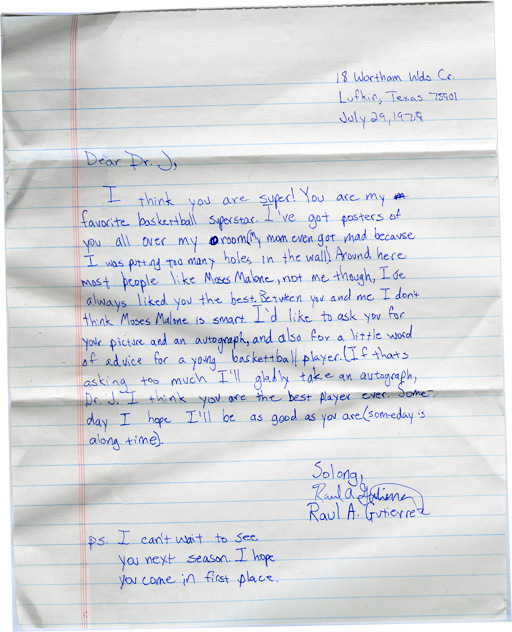 Your letter really reminds me of "Last Days of Summer" by Steve Kluger. You should check it out if you get the chance, I think you'd like it..